A comprehensive five CD anthology telling the story of independent music from Scotland between 1977 and 1989, ‘Big Gold Dreams’ is an interesting box set. From the no-frills and DIY ethics of punk through to lavish alternative pop, Scotland had more than enough talent to make a huge mark upon music in the 70s and 80s and the country’s greatest bands were every bit as good – and better – than many of the hugely celebrated acts from Manchester and the south. 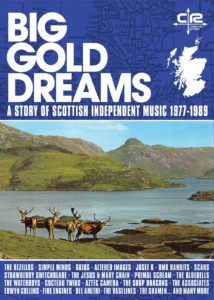 The many independent labels had as much to give the world in terms of underground talent and beyond, so in lots of ways, ‘Big Gold Dreams’ isn’t so much a box set, an anthology or collection as a celebration. For admirers of Cherry Red’s 2018 power pop and new wave anthology ‘Harmony In My Head’ and Edsel’s Gary Crowley curated box set of punk curios, the first two discs of this five disc set will alone be worth the purchase. Covering the period between 1977 and 1982, as you’d expect, these discs have more than a decent amount of punky fare and the nature of the source material means that various obscurities are released on CD for the very first time.